The Adafruit Feather HUZZAH ESP8266 is an 'all-in-one' ESP8266 WiFi development board with built in USB and battery power supplies, including a battery charging port. 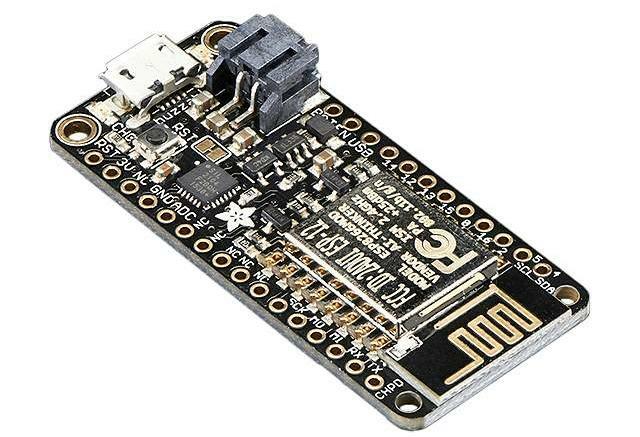 The Feather HUZZAH has an 80 MHz ESP8266 WiFi microcontroller with 3.3V logic and is simply programmed using the Arduino IDE; click here for additional specs on the Adafruit Feather HUZZAH ESP8266. In the following tutorial, Ubidots will demonstrate how to setup and program the Adafruit Feather HUZZAH with ESP8266 using the Arduino IDE and POST the data to Ubidots cloud to be utilized in your Ubidots powered App. 1. Now with everything configured, UPLOAD the Blink Sketch to verify that everything is working properly. Go to File > Examples > Basics > Blink and compile the code. 2. Once the code is properly updated the builtin red LED will start blinking. If the red LED does not start blinking you can know you need to reinstall the board. 1. To post your first value to Ubidots, open the Arduino IDE and paste the sample code below. Once you have copied the code, you will need to assign the parameters: Wi-Fi name and password, plus your individual, unique Ubidots TOKEN. 3. Upload the code into your Feather HUZZAH ESP8266. To do this, choose the "right-arrow"icon beside the check mark icon. 4. To verify the connectivity of the device, open the serial monitor by selecting the "magnifying glass" icon in the top right corner of our Arduino IDE. 5. Confirm your data in Ubidots. Now you should see the published data in your Ubidots account, locate the device called "feather-huzzah" and visualize your data.